Hmmm. I know I mentioned this on Twitter, but I can't remember if I told the blogosphere - have I told you yet that a lot of that Mickey Mouse for Target collection of which I reviewed a bit is at least partially on serious clearance right now? I picked up a bunch of the Mickey face masks at 50% off, as well as a Mickey-themed nail file set for less than a dollar. My Target also had scads and scads of Mickey head-shaped bath sponges if that sounds like something you'd be into. Are my new Under Armour sneakers magic? Stay tuned to find out! And by that I mean, we'll find out together, because it's too soon to tell. Lord knows I could use some magic sneakers. Ah, summer speed runs on the treadmill. In case you're wondering where my arms are on the fitness spectrum, I have to use a chair to do pull-ups. ... 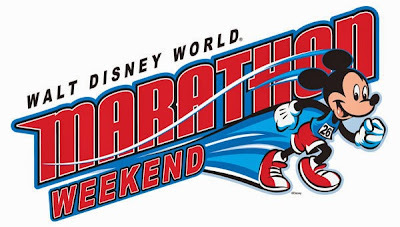 I did already tell you guys I signed up for the 2019 WDW Marathon, right? I mean, it's not like anyone's surprised. I did say I'd never miss it again. But it's certainly relevant. - Fairytales & Fitness does the Animal Kingdom Lodge's culinary tour. Something else to add to my Kidani trip! - Davelandblog shows off a super-nifty vintage Disneyland photo. - An Open Suitcase raves about Wine Bar George. I must go! - The Main Street Gazette tells the story of the Muppets at Walt Disney World. - Kait Around The Kingdom knows where to get birthday freebies at WDW. - The Disney Tourist Blog mourns WDW attractions long passed.